If you were impressed with the Marshall’s Stanmore Airplay speaker, then you will be moved by this new release. When it comes to headphones production, Marshal as earned the badge of trust due to the quality of devices they produced. The Marshall Mid ANC headphones come with a pack of exceptional features. One of the most outstanding properties of this headphone is its active noise cancellation ability. So, if you are working in a noisy environment, this headphone has got you. Want to know more about this admirable device? Read on to find out the impressive features of this device. 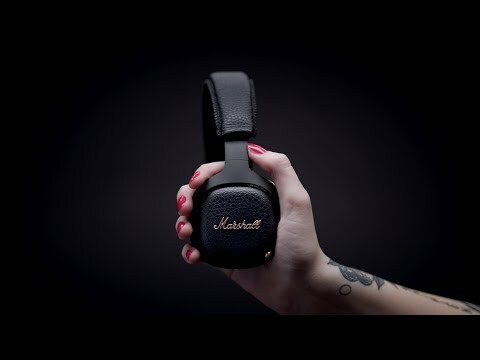 The marshal mid-ANC headphone is designed with an attractive black color that has a golden print of the company’s name. It is built with coiled cables which emerge from the headband and connected to the ear-cups. Its metal headband is covered using a black microfiber. This material is deliciously soft which makes the headphone comfier. Marshal is famous for its consistency in sound quality, and this product is not an exception. It comes with enhanced bass and treble with remarkable volume with zero distortion when mixed-out. If you choose to buy this product, then rest assured that you cannot be disappointed by the sound output that you will get. Its active noise cancellation ability makes the device stand out from the pack. How does it work? Its earcups are designed to block sound from external sources thus maintaining the feel of sound you get. If you need a headphone to use in busy places, then look no further than this device. It lets you enjoy the music of your choice delivering an enjoyable experience. Ever had a bad experience with the control system? This headphone is different. It is built to allow you to take control of the music you are listening in an easy way. The switch feature for noise canceling is also strategically located. Its left cup is designed with a mini joystick and combo button allowing single control for all activities. The manufacturers claim that the device can last for up to 20 hours when using it. This means that you don’t have to worry about interruptions with power failure. Therefore, you can rest assured to get long hours of high-quality entertainment from this device. The marshal ANC also comes with a double ended 3.5mm cable which has two functions. You can use the cable to connect the headphone to another device and for sharing music. Alternatively, when connected via Bluetooth, its socket will act as an output source rather than the normal input functionality. Looking to buy a Marshall Mid Active Noise Cancelling Over-Ear Wireless Bluetooth Headphone click here to read the real customer review and compare and see the price. The Marshall mid active noise canceling over-ear wireless Bluetooth headphone is a great choice if you want to block noise from external sources. Because noise can greatly affect the sound you get, this product is ideal for everyday use. If you need a better experience with your headphones, then you should grab yourself one of these for an enjoyable and amazing music experience.